Named for the cigar-smoking, celebrated American novelist, the Hemingway series by Arturo Fuente Cigars has become one of the most popular All Figurado cigar lines in the entire world. Finely crafted with aged Dominican filler tobaccos, a Dominican binder and African Cameroon wrappers, these cigars present a complex mixture of earth and wood flavors coupled with a crisp, spicy finish. Very nice! “ Hemingway cigars have a very warm place in my heart and in my memories” Carlos Fuente, Jr.
Arturo Fuente Gran Reserva Hemingway is one of the most desired cigars in the world. The limited production of the beautiful Hemingway by experienced rollers are maxed out at 75 cigars per day. Created by Arturo Fuente’s grandson Carlos” Carlito” Fuente, the handmade cigar uses only the families finest private reserve Dominican tobaccos and select rare African Cameroon wrappers. Four years in the making at Tabacalera A. Fuente, the Fuente family selects only tobaccos from the best crop years which are then carefully fermented and aged in Spanish cedar vaults. The Arturo Fuente Hemingway Cigars offer a classic, flavorful smoke. Medium-bodied in strength, the Gran Reserva Hemingway Signature is rich with flavors of spice, brown sugar and earth. 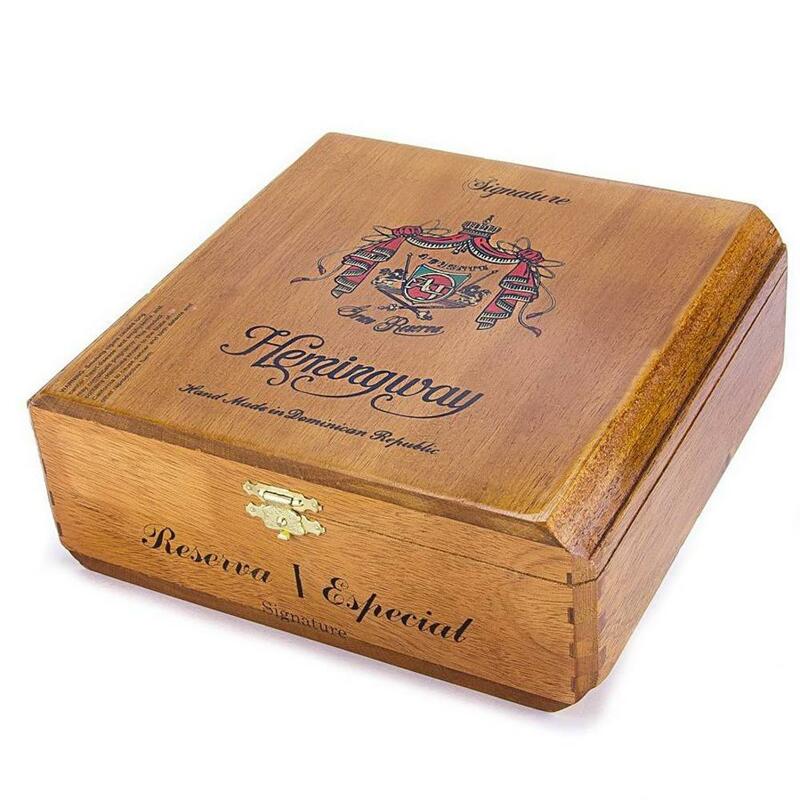 The Gran Reserva Hemingway Signature Natural is available in a handsome, collectible cedar box of 25. This premium cigar is sold online at a great price here at elcigarshop.com. When selecting the perfect pairing with your Hemingway, keep in mind the medium body of the cigar should match the body of the spirit. Bourbon and cigars is an obvious choice. To impress my friends I reach for Rock Hill Farms Single Barrel Bourbon. The Kentucky straight has flavors of smooth vanilla, spice and honey to enhance the notes of your Gran Reserva Hemingway. The combination is subtle and complex, but not overpowering. CHEERS!